I like reading cookbooks. Sometimes I spend an entire evening just looking through them, just imagining what each recipe would taste like, or how I may change it to better suit our tastes. I came across this recipe in an old church cookbook. You know the type I mean – those old spiral bound cookbooks with the stained pages and the cute little notes from the cooks and bakers who’ve made those old recipes for years. Those cookbooks are the best ones – you can always trust them to give you return on your investment. Well, except for all of those jello salads. I just can’t get behind a jello salad. 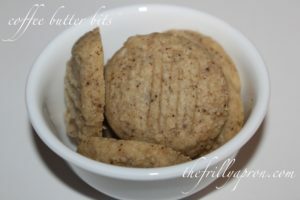 Coffee butter bits are essentially coffee flavoured shortbread cookies. I knew immediately that my husband would love these. Coffee and shortbread – his two favourite things – got married and had a cookie baby. Mix and sift dry ingredients. Blend butter into dry ingredients with a spoon, until a soft dough is formed. Place the cookies on a parchment lined cookie sheet, about 1 1/2 inches apart. Flatten each cookie slightly with a lightly floured fork. Bake for 20-25 minutes. Don't overbake. Bake for 20-25 minutes. Don’t overbake. This entry was posted in all recipes, baking, cookies, desserts, egg-free, sweets and tagged 12 Days of Christmas, baking, coffee butter bits, coffee shortbread, cookie recipe. Bookmark the permalink.